President Trump issued a blunt warning to Mexico and other Central American nations over their failure to stop illegal migrants and criminal cartels targeting the U.S. southern border, saying he would send the military and shut down the southern border. Trump made his threat in tweet storm Thursday morning in which he said the newly negotiated trade deal with Mexico would take second place to border security. 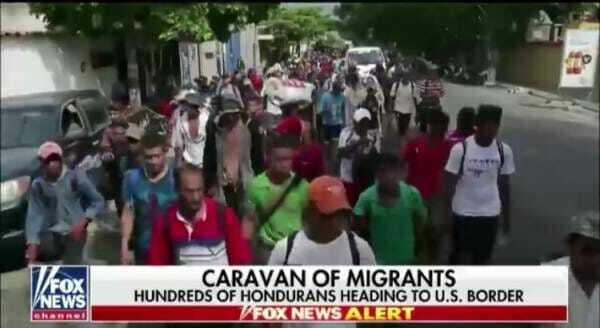 Over 4,000 migrants are now reported to be in the caravan headed to the U.S.
A horde of thousands migrants from Honduras and other Central American countries on an organized to the U.S. are approaching the Mexican border. Mexico is reportedly sending federal police to stop them. Over 16,000 illegal alien migrant family units were arrested at the southern border in September. “I am watching the Democrat Party led (because they want Open Borders and existing weak laws) assault on our country by Guatemala, Honduras and El Salvador, whose leaders are doing little to stop this large flow of people, INCLUDING MANY CRIMINALS, from entering Mexico to U.S…..